International dinners are a very widespread activity between exchange students. During your Erasmus period, you’ll have the chance to meet dozens of people from different countries. It’s always a good idea to organize an Erasmus International Dinner with those new friends in order to know more about eachother. Basically, an international dinner consists on having a dinner with students from different contries. Each students has to cook the most typical meal of his/her country in order to show the rest what they normally cook in his/her country. In this post, we will show you some of the most typical meals you can find in an international dinner. Ready? It doesn’t matter the country you choose, to study, you are going to find Italians for sure. And if you are spending your Erasmus period in Spain, be ready to share a dish of pasta with an Italian. Without any doubt, pasta is one of the favourite meals for Italians and nobody can cook it better than them. As an advice, NEVER cook pasta for Italians, they’ll criticize how you cook it. Apart from pasta, lasagna, pizza and risotto are also Italian meals, so you should also expect them in an international dinner with italians. The German gastronomy includes a vast variety of meals. Depending on the region, you’ll find different kind of meals, normally infuenced by the surrounding countries. However, there is a famous meal we all know: Bratwurst, the typical sausage we can find in almost every German city. This particular sausage is also one of the favourite meals for Germans during the Oktoberfest. But German gastronomy is not only about bratwurst and beer, they also have Sauerkraut, Brötchen or the famous Bretzels. Forget about prejudices, Germans are very kind people and not as cold as you think. Have a beer with them and you’ll discover how amazing they are. The French gastronomy is one of the most reputated gastronomies around the world. So much so, that it has influenced the gastronomies of the surrounding countries and it has inspired chefs from many countries. It’s very difficult to say what’s the best meal from France, but we have to say that they are really, really good at bakery. One of the most tasty desserts from France is Quiche Lorraine, a salty pie that can include, bacon, cheesse and vegetables. Apart from Quiche Lorraine, we can find Crepes, probably the most known French meal. You can eat crepes with salty or sweet food, it’s up to you and your chef! Like in France, the Spanish gastronomy is also very varied. We can find different typical dishesin every single province of the country, from bacalao al pilpil to jamón serrano. However, there is an internationally known dish: Paella. Original from Valencia, the Paella is an special way to cook rice. There are different kinds of paella, depending on if it’s cooked with fish or with meat or chicken. But as said before, paella is not the only famous Spanish meal. 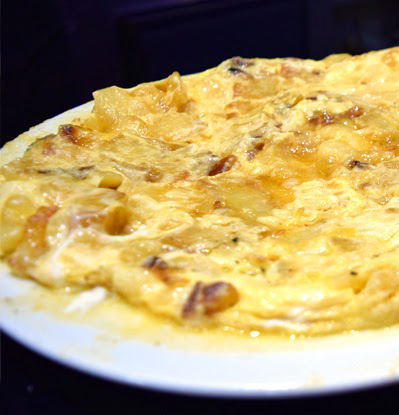 Spanish students are also known for cooking the best Tortilla de Patata (Spanish Omelette).